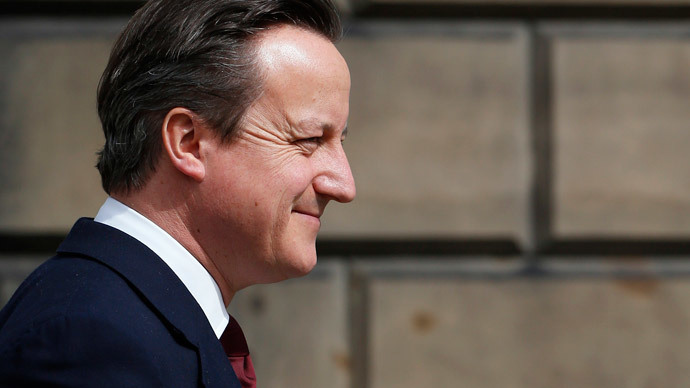 Prime Minister David Cameron has arrived in Glasgow to meet Scottish National Party (SNP) leader Nicola Sturgeon. The Scottish First Minister is warning of a second independence referendum if Cameron fails to deliver on devolution pledges. Sturgeon shook hands with Cameron on the steps of Bute House before heading inside to debate what powers should be handed over. In last week’s general election the SNP devastated its rivals, securing 56 out of 59 contested parliamentary seats. In an effort to oppose austerity and gain more powers for a devolved Scotland, Sturgeon will use her meeting with Cameron to lay out her list of demands. The list includes more control over the minimum wage, welfare, national insurance contributions, commercial taxes and equality policy. The SNP leader has already warned Cameron that if he doesn’t listen to her proposals the people of Scotland could demand another independence referendum. A senior SNP source has confirmed they are prepared to push for another referendum without the prime minister’s permission. Cameron says he will remain understanding and reasonable in the meeting but adds Sturgeon “must respect” his role as PM. Ahead of the meeting Cameron confirmed the UK government will “remain true” to its promise to hand over powers to Scotland agreed by last year’s 2014 Smith Commission on further devolution. The Smith Commission agreement would only allow the Scottish government to set rates and bands of income tax and give it control over £2.5 billion of welfare spending. Cameron says it will be taken forward in a new Scotland devolution bill in the first Queen’s Speech. He will reject Sturgeon’s list of demands for extra powers not laid out in the Smith Commission agreement. “As more powers are devolved to Scotland, it is time to move beyond the debate about process and focus on those bread and butter issues that affect every family in our United Kingdom,” the prime minister said. The SNP leader will tell Cameron the general election results are solid proof that more powers must be handed to Scotland. Nicola Sturgeon did not lock David Cameron out of 10 Downing Street. She showed him where the keys were hidden. The senior SNP source said Cameron would not be able to refuse another demand for an independent vote. They further claimed a second referendum would be won if it were to take place tomorrow. It “only has to be won once” the source added. However, a spokesman for Sturgeon said these claims are “totally wrong,” adding there are “no such plans” to push for another referendum. “The position is crystal clear – the general election was not a mandate for another referendum,” the spokesman said. “There will only be another referendum if and when the people of Scotland back such a proposal at a Scottish parliament election,” he said. “It is not for David Cameron or any other single politician to try and dictate what Scotland’s future should be; it will always be in the hand of the people,” he added. Before the meeting, Sturgeon said she is “looking forward” to serious and substantial talks with the prime minister. “Scotland expects these powers to be delivered,” she said.